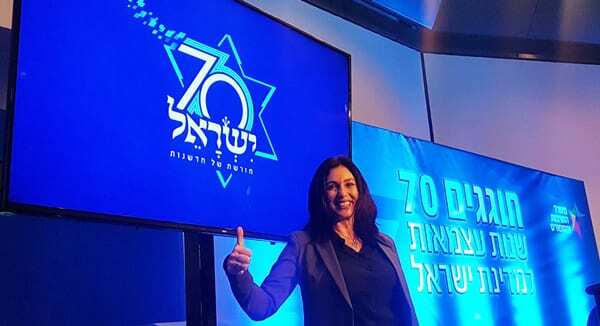 Plans for celebrating Israel’s 70th birthday events have been announced by Minister of Culture and Sport, Miri Regev. The event included an unveiling of the logo that will accompany the celebrations throughout the year. A Star of David appears at the heart of the logo – a symbol of the strength and determination of the people of Israel since the time of King David. The Star of David received a modern design, in which the number 70 was incorporated with lines that burst out and continue as pixels, and symbolizes two things: Eternity alongside innovation and progress. The theme for Israel’s 70th was also revealed: “Heritage of Innovation”. “Israel and the World Sing Together” – Following the torch-lighting ceremony, a countdown will take place, after which the entire state of Israel and Jewish people around the world will sing one song together. During the last chorus of the song there will be a firework show, one of the largest to take place in the state of Israel. “70km Party” – A beach party that will take place from Tiberias to Eilat, in which young people, in both body and mind, will enjoy good music, dancing and celebrations all night long. “Soundtrack Event for Israeli Society” – The closing event for the 70 hour celebration will be in honor of the artists among us, both those that are alive and those that are no longer with us. As part of this event, never-before-seen collaborations will take place onstage. Celebrations will take place in April.